Caustic Soda Issue 1 will make it’s “Con” debut this weekend during Denver Comic Con. The books illustrator, Dan Crosier and writer Shane Roeschlein will be at Booth 933. We’ll have prints of the mag-sized, limited run, Caustic Soda – A Year Future Narco Romance Issue 1. This is part 1 in a three part series titled, Hello, the War is Here and will be collected into a 72-page graphic novel, set for release in 2015. The issue features (pictured below) a skate-punk themed cover by artist Joe Triscari of Moonlight Speed. If you are at DCC this weekend, stop by booth 933 and say hello. We’d love to meet you. 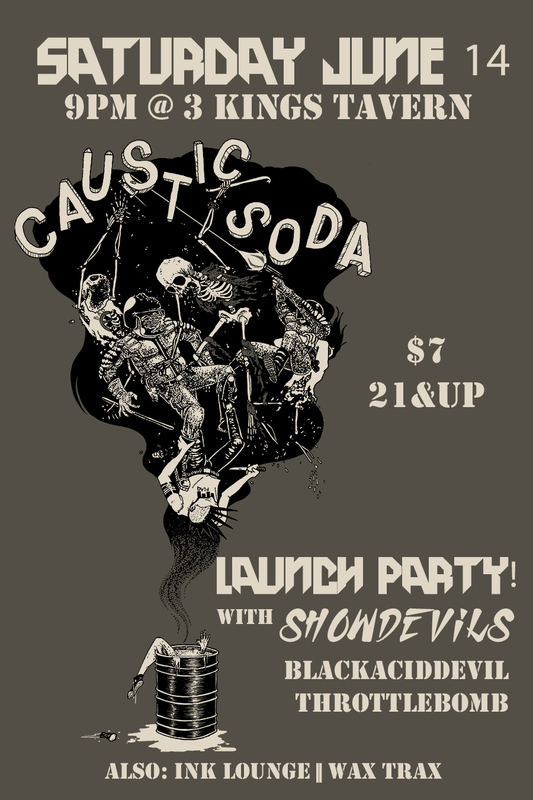 We’ll have copies of Caustic Soda issue 1 available along with prints of the limited run, Caustic Soda t shirt. Or if you can’t make it into the city for DCC, join us Saturday, June 14 at 3 Kings Tavern for a launch party with bands, Blackaciddevil, Throttlebomb and a performance by Show Devils featuring Enigma and Serana Rose.